Finding Meaning In Suspicious Activity Reports Discerning real tips from the merely suspicious or paranoid reports submitted to law enforcement is sometimes more of an art than a science. 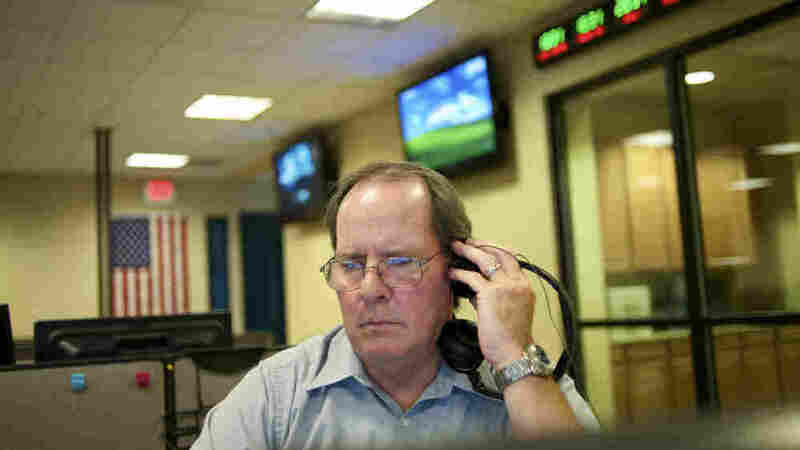 At a fusion center in Las Vegas workers like Daniel Burns, a program coordinator, analyze suspicious activity reports. The suspicious activity reports submitted by the Mall of America's security team frequently land at the Minnesota Joint Analysis Center, one of 72 "fusion centers" in the United States started with federal funding. The reports are routed through various law enforcement and intelligence networks, often ending up in front of local analysts and the FBI. What is a fusion center? from CIR on Vimeo. Those networks include local police databases and state fusion centers that collect and disseminate homeland security intelligence, along with systems run by the FBI and other federal agencies. But discerning the meaningful tips from the merely suspicious or paranoid reports is sometimes more of an art than a science. After struggling to define "suspicious activity," federal homeland security officials issued a set of standards in 2009 that included this definition: "Observed behavior reasonably indicative of preoperational planning related to terrorism or other criminal activity." More than 15,000 suspicious activity reports are available to law enforcement officers and analysts through one national computer network called Shared Space, officials said. Only half the states and a handful of cities are connected to the system now, and reports must meet certain standards before they can become nationally searchable. Florida generated 5,700 reports during a test phase, but only a dozen met the threshold. One FBI system called eGuardian, which is part of the national network, contained nearly 9,050 reports by August of this year. Federally funded researchers examined 40,000 standard 911 calls placed between 2005 and 2007 from people in Washington, D.C., reporting suspicious cars and vehicles. None of them were clearly linked to instances of terrorism. Prepared on behalf of the National Institute of Justice, the report concluded that fewer than 200 were classified as even "potentially" related to terrorism. The government insists there are success stories. Authorities arrested a man in Texas earlier this year after two companies reported to police that he tried to ship bottles of a chemical called phenol from North Carolina and made a suspicious order of biological supplies. He eventually was charged with attempting to use a weapon of mass destruction. His alleged list of potential targets included the home of former President George W. Bush. They also point to what's known as the "Newburgh 4" case. An employee at a self-storage facility in New York called police after seeing something unusual at work. An FBI investigation was already in progress, it turned out, and the individuals considered suspicious were under surveillance. Police later arrested four men for plotting to destroy synagogues. The four men were convicted last October. But the case remains controversial — critics say an FBI informant nudged the scheme along. The presiding judge later referred to it as an "un-terrorism case." Civil-liberties and privacy advocates, including members of Congress, have criticized some homeland security initiatives as intrusive and prone to abusive profiling. These advocates say such reporting can fuel anxiety and create a chilling atmosphere in which people who seem different are targeted for extra attention. Suspicious activity reports, they add, are part of a broader trend of surveillance of the innocent and suspect alike since Sept. 11. Geoffrey Stone, a constitutional law professor at the University of Chicago, said that government officials should consider the ways a program affects the exercise of political and religious beliefs, regardless of whether they insist the information is being used appropriately. "People could be afraid it's not being used properly, and they're not going to go to that mosque, or they're not going to go to that demonstration or they're not going to sign that petition," he said. Despite the criticism, the number of suspicious activity reports in circulation is rising. You have just a tremendous amount of information going into the intelligence-sharing apparatus in the hopes that it will either come up with terrorism or suspicious activity or criminal activity. "You have just a tremendous amount of information going into the intelligence-sharing apparatus in the hopes that it will either come up with terrorism or suspicious activity or criminal activity," said Juliette Kayyem, a former homeland security assistant secretary in the Obama administration and a onetime adviser to Massachusetts Gov. Deval Patrick. "That's a lot of input ... to ensure that you're going to connect the dots better, right? One clear way is to make sure the dots are better. There [are] too many dots right now." James Steiner, a retired CIA analyst, believes the reports provide valuable information and should be welcomed by counterterrorism officials — as long as it's good information. But it's not yet clear whether the reports accumulating in various networks now meet that standard. "We need to have good general public awareness," Steiner said. "But what we really need are trained observers. We can do lots and lots of public advertising, but we've got to be careful. Otherwise, we do the job of the terrorist and scare the hell out of the American people. We don't want to scare ourselves so much we can't get on with our lives." G.W. Schulz and Andrew Becker are reporters at The Center for Investigative Reporting.